#2 - Jean Pierre Polnareff: While each of the Stardust Crusaders undergoes a certain degree of maturation during their quest to defeat Dio Brando and all of his dark underlings, Polnareff’s is perhaps the most drastic. Much like Noriaki Kakyoin, Polnareff is introduced as a foil to Jotaro and company, having been infected by one of Dio’s vampire spores. After having it removed, Polnareff reveals that he wishes to join the Stardust Crusaders in order to track down J. Geil, the man who killed his sister. Polnareff’s original reason for tagging along on the arduous, often wacky journey to Egypt was to seek revenge – plain and simple. However, seeing this task to completion was costly, as Avdol nearly died in the process. As Polnareff was unaware of his friend’s survival until meeting up with him on the island after his wounds had healed, he spent a good deal of the time grieving and beating himself up over those events. He came to place greater trust in his comrades, value the particular skills they brought to the table, and work better as a team player, assisting Kakyoin in battling the Lovers Stand on a microscopic scale and trying to protect friends new and old in a child’s body when fighting Alessy. 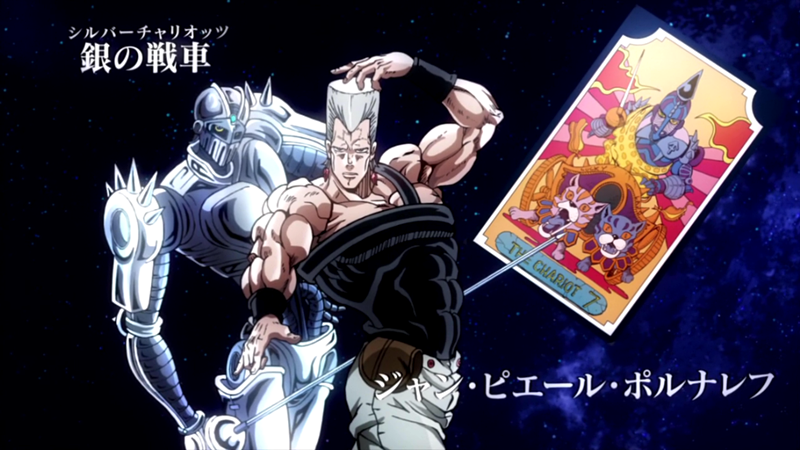 That is not to say that Polnareff’s role as comedic relief was lessened any, but it was altered. Later in the Stardust Crusaders arc, Polnareff largely cuts out his ogling of women and attempts at being a smooth talker. Instead, he has a couple of awkward run-ins with rival and foe Hol Horse, one where he is nearly forced to lick clean a toilet bowl, and the other resulting in his nostrils being invaded by two of Hol Horse’s fingers. 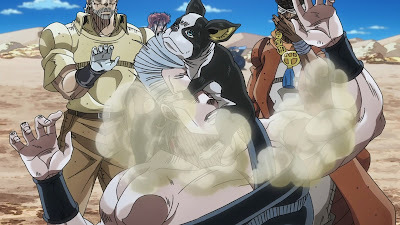 Iggy gives him a difficult time as well, viewing Polnareff’s hair as his new favorite chewing toy and farting in his face while he mauls the Frenchman’s carefully-sculpted flat-top. Polnareff’s Silver Chariot is all about quick and decisive strikes. Against less calculating foes, it’s a force to be reckoned with, but as proves the case late in the Stardust Crusaders arc, it is less than ideal for fighting the likes of Vanilla Ice’s Cream or Dio’s The World. Still, Polnareff is never one to give up, knowing how much his friends have sacrificed to allow him to live on and fight another day. He is the first of the heroes to encounter Dio Brando during the buildup to the final climactic battle, and despite Dio’s taunts, chooses to charge him head-on. While Jotaro is responsible for the majority of the damage Dio takes during the nighttime showdown in the streets of Cairo, Polnareff comes to his aid, piercing through Dio’s skull, aware that such a brash surprise attack could spell his own death. But after witnessing the deaths of Avdol and Iggy, and knowing that Kakyoin and Joseph had similarly fallen in combat with Dio, he was determined to do whatever he had to in order to stop the powerful vampire. Polnareff, Joseph, and Jotaro eventually part ways after letting Dio’s body crumble to ash in the desert sun, but he makes a return in the later chapters of the fifth arc of Jojo’s Bizarre Adventure, Vento Aureo. Polnareff plays the part of the contact Giorno Giovanna and the rest of the Gangstars are supposed to meet up with, and explains how he spent the years post-Stardust Crusaders researching the arrow until his leads led him to Italy and Diavolo, the man who crafted the arrows and ultimately put them into hands of Dio and Yoshikage Kira’s father, among others. Polnareff’s deductions cost him yet again, however, as he lost both of his legs in a battle with Diavolo, resulting in his being wheelchair-bound. However, Polnareff has an ace up his sleeve in the form of one of the arrows, which he uses on his own Stand, elevating it to Silver Chariot Requiem, and losing control of it entirely as it rampages of its own will. During the chaos that erupts in the coliseum, Polnareff’s consciousness leaves his human body and is transferred to that of the turtle that had previously offered the Gangstars a safe haven from Diavolo’s thugs. 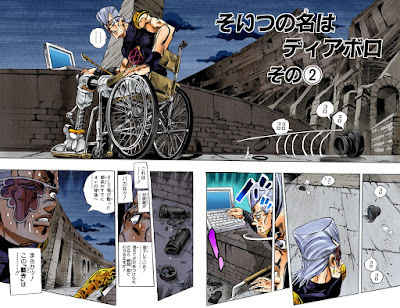 Still able to speak, Polnareff offers what limited assistance he can to the Gangstars as the climactic showdown with Diavolo draws near, and at the conclusion of Vento Aureo, Polnareff is shown to be very much healthy and alive in the company of Giorno and the surviving Gangstars, albeit as a turtle. Theme images by IntergalacticDesignStudio. Powered by Blogger.